Journey through a uniquely-stylized RPG world in search of salvation and glory. 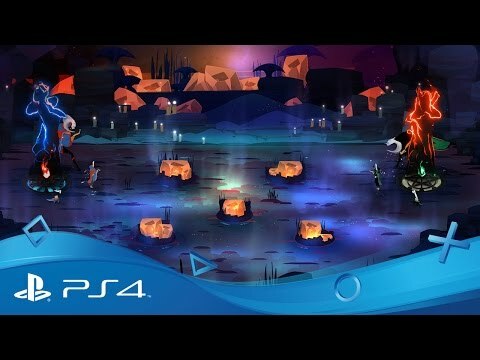 Journey to the mystical, otherworldly realm of Downside and search for a means to reclaim your former glory in Pyre, an RPG adventure from the creative minds behind Bastion and Transistor. Exiled in a forgotten nether realm, lead your party of colourful misfits across the land, engaging in a series of ancient competitions known as Rites. Strive towards enlightenment with each victory or defeat, learning more of the world around you and moving ever closer to redemption. Outside the branching narrative of the main story, you’ll be able to compete with friends in intense one-on-one multiplayer matches, where two teams of three will face-off in an attempt to extinguish one-another’s pyres. Fight a mechanized threat that has stolen the future from mankind. Immerse yourself in the classic PS2 role-playing game, reborn in High Definition on PlayStation 4. Turn the world upside down once more as Kat and Raven return in Gravity Rush 2 on PS4.